Die shear testing is an important step when investigating the mechanical reliability of conductive adhesives that are used between the die and substrate. When designing modern surface mount assemblies, manufacturers are constantly formulating novel isotropic conductive adhesives that can improve the shear strength over traditional adhesives. Additionally, experts are interested in understanding the failure analysis post-shearing of the die. As the high density packaging and component miniaturization trends continue to grow, electronic packages are getting smaller and thinner in size. As a result, it is critical to understand the mechanical performance of these components. 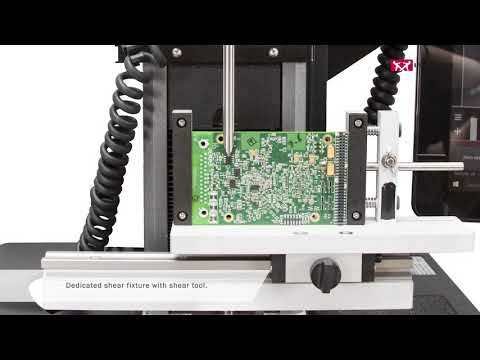 Die shear testing can be performed on either a single or dual column system with Instron’s Terminal Strength Shear Fixture (CP122690), which was designed by our Custom Solutions Group and is used to hold a sample populated printed circuit board (PCB) and shear target components. The fixture consists of an adjustable PCB holder that can accommodate a variety of board sizes and a linear rail, allowing the operator to center the probe on the component of interest. A variety of probes can be utilized to test components of different sizes. Bluehill® Universal software can be used to create test methods, and results such as maximum force can be measured. For a visual representation of die shearing, TestCam is offered to capture real time video with Bluehill Universal.